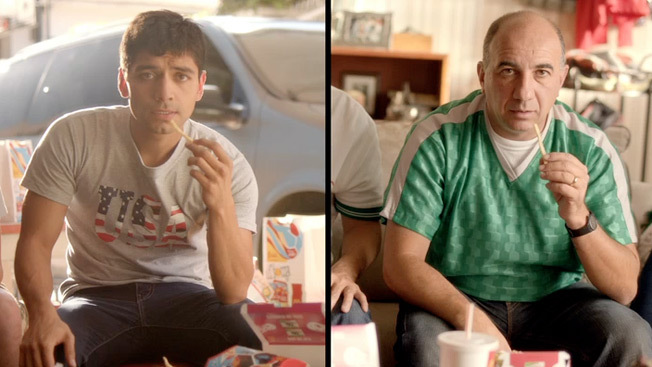 You can always count on McDonald's for more modest World Cup advertising—simple stories about family and friends, not flashy spots with overpaid stars. Some of it can be hokey, though sometimes it captures little truths that are quietly sweet and evocative. This spot from multicultural agency Alma zeroes in on a great cultural insight in the Mexican-American community: what happens when a father and his friends still unequivocally support Mexico, while the son, as secretly as he can, roots for the U.S. The ad was directed by Diego Luna, still perhaps best known as Gael García Bernal's co-star in 2001's Y Tu Mamá También. The humor is broad, and the acting isn't subtle, yet it's one of those ads you can't help but like. Shot in both English and Spanish, it breaks Thursday and will air in general market and Hispanic media throughout the World Cup.